The Rossovermiglio company, owned by the Verlingieri family, is located in the flourishing Samnite countryside, in a territory with a millenarian wine-making vocation. The company owns some of the best-positioned vineyards in the area, and boasts a long family tradition in producing quality wine. The long experience, the knowledge of the vineyards, and of the vines of the territory are the company's strengths. Rossovermiglio wines are all born from a skilful combination of tradition and innovation. Each bottle is the result of a precise business strategy dedicated to offering great wines of the territory. K nowing your own vineyards, and taking care of them with the maximum dedication, this is the philosophy behind the production of Rossovermiglio wines. It is not a coincidence that an ancient popular saying states that good wine is born in the vineyard. Having a quality raw material, however, is only the beginning. The cultivated vines are just as important in a quality oriented production strategy. 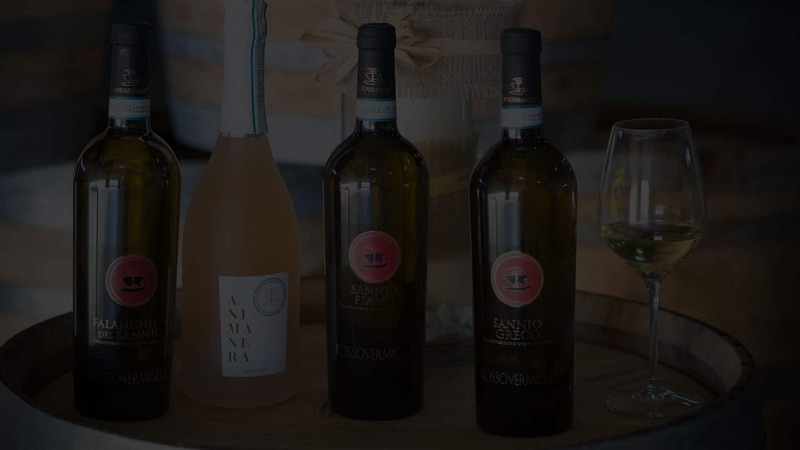 Respect for the territory of origin, and its long wine history, have led the owners to cultivate exclusively local autochthonous varieties, such as Falanghina, Fiano, Greco, and Aglianico. All grapes of ancient origin that in the Sannio Benevento have found their land of choice, and where today they are able to express at best all their potential. T o be able to control the entire production chain in the best possible way, it was decided to work exclusively with grapes produced exclusively in the vineyards owned. The method of breeding grapes privileges especially the espalier system, and the low yields. All activities in the vineyard are conducted manually by expert local winemakers. From green pruning to topping, from defoliation to the thinning of the bunches, up to the harvest, everything is done strictly by hand ,respecting the local tradition. It is from these grapes that Rossovermiglio wines are born. From the maniacal care in the vineyard, from a very generous land like the Samnium, and from the long experience of the Verlingieri family in the production of quality wines. Rossovermiglio produces only wines from native vines of Campania. An intentional choice to enhance the character and the typicality of some of the best Italian vines. The winery is equipped with all the most modern equipment, and allows us to vinify with strict processing methods the grapes carefully picked and selected. All the processes of production and vinification of the grapes are constantly followed by the owner Piero Verlingieri, well-known agronomist expert of the territory. The wife Maria Teresa instead, sommelier A.I.S., deals with the commercial part and the promotion of wines in various sector events both in Italy and abroad. Rossovermiglio is a growing brand, and today gathers the fruits of a long and meticulous work aimed at obtaining the best possible wines.